A berry-bearing shrub with colossal 10" clusters of pink blooms, gorgeous lacy foliage and a light lemony scent? Black Lace Elderberry boasts all this—and more. 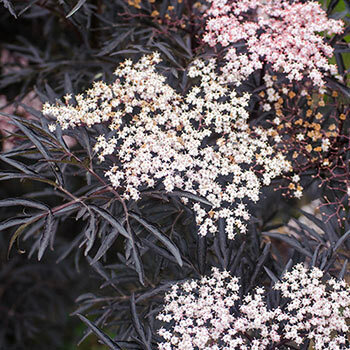 Its delicate, rich purple foliage is so dark that it looks almost black. Its flowers attract butterflies in early summer before producing berries eaten by more than 50 bird species. The shrub is sturdy and easily grown. While it prefers a moist, well-drained soil with a large humus component, it adapts to drier conditions. Because it accepts pruning well, it can be kept at any size, although it flowers more if heavily pruned only every third year. Deer tend to avoid. Ships now, already established in a garden-ready gallon pot. PP15575. Planting Instructions: Leaf color is best planted in full sun.